World Sight Day, celebrated this year on Oct 11, is an annual day of awareness around blindness and visual impairment. The rolling theme for the World Sight Day is ‘Universal Eye Health’. The ‘Call to Action’ this World Sight Day is ‘Eye Care Everywhere’. 80% of the world’s blind are avoidably so. On this day, NGOs, DPOs and civil organisations all come together to raise public awareness of blindness & vision impairment as major international public health issues and also influence Governments and Ministers of Health to participate in and designate funds for national blindness prevention programmes. Read below how CBM are working worldwide to eradicate avoidable blindness. In September 2018 CBM participated in the annual NTD NGDO Meeting in Addis Ababa, Ethiopia, which was attended by over 500 global participants. CBM’s delegation actively contributed to sessions, which included the following topics: stigma and mental well-being, working in conflict settings, disease management, disability and inclusion, behaviour change, integration of water, sanitation and hygiene (WASH), cross-sectoral partnerships and transition and sustainability planning to support health systems as funded programmes end. Additionally, we hosted a pre-meeting for NTD affected people to strengthen active participation of affected people as a human right. We also took the opportunity to launch our CBM NTD Report 2018 at the conference. Read more about this conference here. More than 1 billion people – one-sixth of the world’s population – are affected by one or more neglected tropical diseases (NTDs), and another 2 billion people are at risk, mainly in the tropics and sub-tropics. Take a look at our Neglected Tropical Diseases 2018 Report for more information about our work with NTDs. ‘Inclusion Made Easy in Eye Health Programs’ is designed for program staff in international development organisations. It is a brief, practical guide on how to ensure eye-health programs are disability-inclusive. Babiwemba has trachoma trichiasis in her left eye and is examined at home in the DRC, before receiving sight-saving surgery. This year Ghana became the first African country to eliminate the leading infectious cause of blindness. CBM was involved in the very beginning of trachoma control in the West African country by supporting training, funding outreach programmes and contributing to research. Read this article for more information on our work in Ghana. Antibiotics to treat the world’s leading infectious cause of blindness were delivered to thousands of people living in remote corners of war-torn Yemen for the first time ever in May 2018. More than 444,000 doses of the drug Zithromax®, donated by pharmaceutical company Pfizer, were driven by local health officials through conflict zones where trachoma - a painful but preventable eye disease - remains prevalent. The distribution was the result of global collaboration between the Yemen Ministry of Health and other NGOs including CBM. Read more here. A group of community health volunteers take part in training to distribute the first ever treatments for blinding trachoma in Yemen. Copyright Yemen Ministry of Health. This year we launched a three-year intervention programme to prevent childhood blindness and visual impairment in Nigeria. 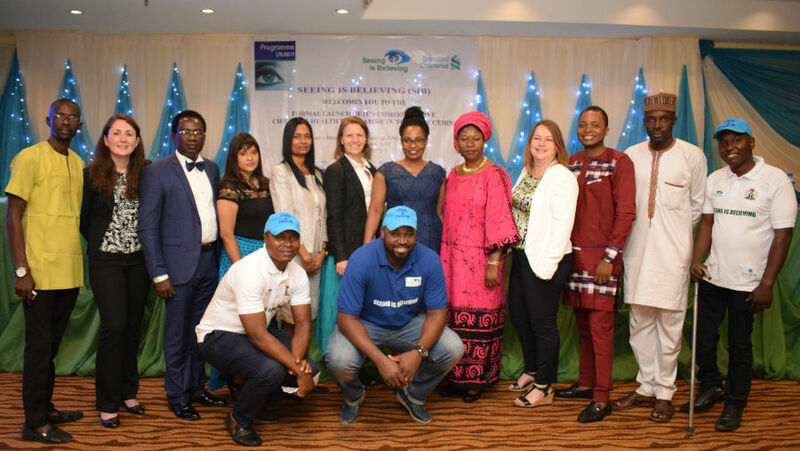 1.5 million children in 11 States of Nigeria are expected to benefit from the new programme, which will improve access to sight-saving eye health services through a wide range of activities, including training health and community workers, funding treatment and providing glasses and low vision devices. Read this article to know more. To help eradicate avoidable blindness, you can support CBM’s work by giving a gift today.